Persistence of Vision for your Bike! This kit isn't made anymore, but we're keeping the documentation up anyways! Enjoy but we don't have this for sale! Get your bench set up for soldering. Place and solder in the 3 resistors, they don't have a specific orientation. Place and solder in the zener diodes, making sure that you have the black stripe on the diode aligned with the white stripe on the PCB image. 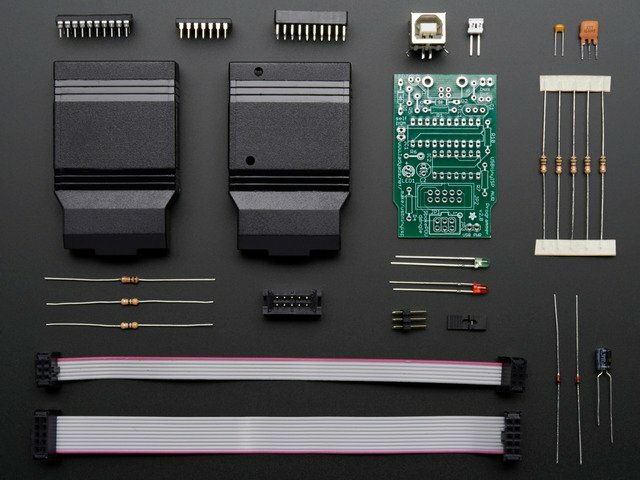 Place the box header, matching the notch up, and the DB9 connector on the edge of the PCB. Solder both, making sure that you get solder underneath the pins of the DB9. This guide was first published on Apr 17, 2014. It was last updated on Apr 17, 2014. This page (Serial Dongle) was last updated on Apr 08, 2019.